Although the Rangers have won 11 of their last 13 games, they’ve lost twice in the past seven days, including barely scarping by for wins against the Panthers and Predators, two games where they did not play all that well. They still are sitting in first in the Metropolitan, but the Capitals (15-5-1, 31 PTS) are not far behind. While they fixed some of the problems against Montreal, like better possession and more shots on goal, but sloppy play, turnovers and mental errors on defense plagued the team again, committing 18 giveaways (Staal led with 3) and setting up the Canadiens for some easy goals. The burden fell on Lundqvist’s shoulders, and he wasn’t able to bail them out and make up for their mistakes. If New York wants to come away with a win against the Bruins, who are starting to piece things together, the mental errors need to come to a grinding halt. The turnovers have to stop, the defensive lapses and blown coverages can’t happen, and the play in front of Lundqvist needs to improve. Special teams will play a huge role once again, because Boston are power play wizards. The Bruins lead the league with a 30.8 percent conversion rate on the man advantage, scoring 20 power play goals on 65 opportunities. But the Rangers have the third best penalty kill in the league (85.5%), and with the way they’ve committed penalties, they’ll need it. 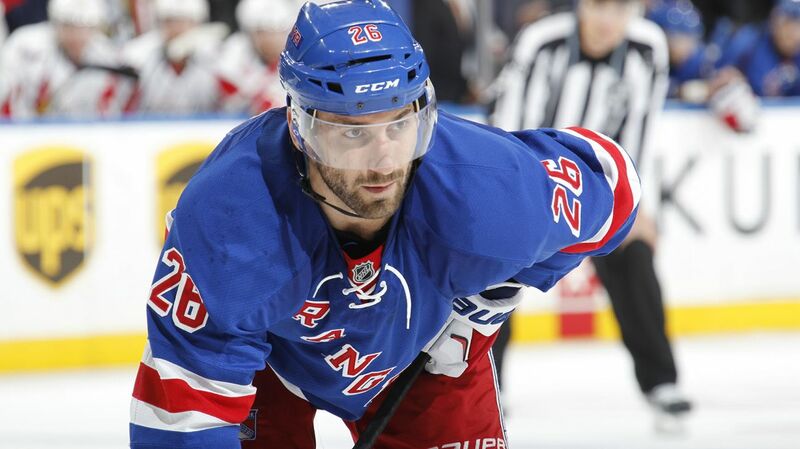 Jarret Stoll and Dominic Moore will need to be at their best on the penalty kill, especially against the Boston Bruins. Photo courtesy of Getty Images. But the special teams also matter in the other direction too. New York has seen their power play improve in recent games, rising to 19.6 percent this season, scoring a goal on the man advantage against the Canadiens. The Bruins have really struggled to kill off penalties, sitting at 27th in the league, killing off 75.6 percent of the power plays they concede. The Bruins have some big scorers on their team, including Patrice Bergeron (7-13-20), David Krejci (8-15-23), and Loui Eriksson (9-10-19). Brad Marchand is off to a solid start, leading the team with 10 goals. Eriksson is the go-to guy on the man advantage, leading the team with five power play goals. Jimmy Hayes was acquired from the Florida Panthers in the offseason, bringing the Boston native to his hometown team. He started off the season well, but has been held pointless in his last nine games. Hayes scored against the Rangers last year, and I think he’ll have a good game today too. Following their last game, there’s not many players to point out on the Rangers. Rick Nash has started to score again, finding the back of the net five times in the last three games, scoring in all of them. Derick Brassard collected his 300th career NHL point, and Mats Zuccarello is leading the team with 21 points (10-11-21). But Vigneault needs production from the rest of his lineup too. Following his move back to wing and the second line, Hayes responded with a goal and an assist against the Predators. But the rest of the second line is struggling. Derek Stepan has had ups and down this season, not playing consistently as of yet. He’s been strong recently, collecting three points (2-1-3) in the last five games. But Chris Kreider is currently AWOL. After a three game point streak, Kreider has no points in the last four games, and he hasn’t really been noticeable either. Kreider was supposed to be counted on as a big goal scorer, but his three goals in 22 games is far from acceptable. He needs to improve and start scoring, and fast. There will probably be some lineup changes for this game, and AV was weighing his options with Emerson Etem and Dylan McIlrath. I think both will wind up playing, especially McIlrath, with the physical style of play the Bruins play. Etem could come in for Viktor Stalberg, who has struggled lately. 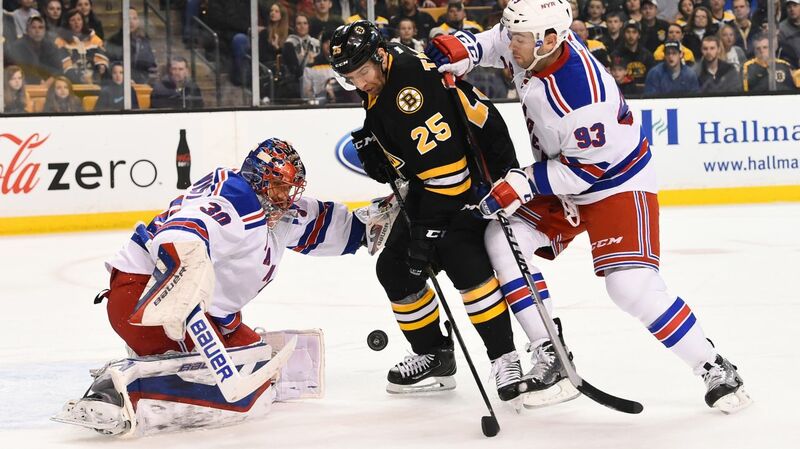 The Rangers and the Bruins will face off at the TD Garden at approximately 1:22 PM. The game will be broadcasted on NBC. Posted on November 27, 2015, in Game Previews and tagged Alain Vigneault, Boston Bruins, Brad Marchand, Chris Kreider, Dan Boyle, Dan Girardi, Derek Stepan, Derick Brassard, Dominic Moore, Dylan McIlrath, Emerson Etem, Jarret Stoll, Jesper Fast, Jimmy Hayes, JT Miller, Keith Yandle, Kevin Hayes, Kevin Klein, Marc Staal, Mats Zuccarello, Montreal Canadiens, MSG, New York Rangers, New York Rangers blog, NHL, NYR, Oscar Lindberg, Rangers, Rangers blog, Rangers Bruins, Rick Nash, Ryan McDonagh, Tuuka Rask, Viktor Stalberg. Bookmark the permalink. Leave a comment.